The rain was falling till mid day and wind was NNW 10 knots There was a rumour, this would clear up lunch time, and some aviation would take place. There are always things to be done so everyone set off to carry out chores until lunchtime. Our winch master was keen to reassemble the ML winch after essential maintenance and give it a good workout. He was ably assisted by RIck Wiles, I'm pleased to report after 39 launches the winch performed faultlessly ably driven all day by the man himself Allan Ballard. ( winch master ) with Martin running cables. Don was on top form, for all the solo and bronze pilots he managed to deliver two clear and precise lectures on what must be one of the most difficult subjects to grasp – tephigrams. Thank you Don I am sure every one will benefit from these irrespective of age or ability. David Jesty DI’d BVB and assisted Don, flying with Martha. Matthew and Rick had rigged the SF 27 and after Don had given Rick a type conversion briefing, he and Matthew shared the SF for the rest of the afternoon with some reasonable soaring flights. RIck had obtained a 30 minute soaring flight on his second flight on type. Well done to him. I am not sure but not to be out done Matthew may have beaten that on the last flight of the day. We welcomed a visitor from Nympsfield, Tim who paid us a visit whilst in the area. Martha and Martin Cropper spent the best part of the day working on another project, which will come to light soon. Matthew worked hard retrieving gliders and launching them while I manned the launch point and log keeping. At 7pm Martha was still hard at work on the computer assisted by Martin Cropper. Bit of a damp & grey start but a nice fry up soon puts a better gloss on the day. Forecasts suggested things would improve in the afternoon so the assembled crew set about various fettling, tidying and repairing tasks. Some excellent teamwork made light of what could have a been tedious jobs. In fact so much satisfaction was being gained that when conditions did become flyable, after lunch, we all elected to carry on with what we were doing. End of day beers were very well earned and all the more enjoyable for that. Low cloud, mist and occasional rain ( again! ). The flying start was delayed due to the weather, so on with the lectures for those who needed them. This included Darren Wills who took and passed his Bronze “C” exam. Well done Darren. There was a brief improvement in the weather so, glider out, and everyone got a chance to practise coping with aborted launches to a 600 foot cloudbase while dealing with the moderate cross wind. Educational. The weather closed in so, glider back to the hangar and what turned into a lively discussion on polar curves and speed to fly. The technical team and helpers used to availability of the gliders in the hangar to push forward with the upgrading of BVB – the repaired wingtips and various patches were painted, the painted registration letters removed and replaced with very smart computer cut lettering and DGS branding applied. Thanks once again. The day finished with a committee meeting planning the purchase of new aircraft which was followed by a barbeque. Having to endure ‘war stories’ by veterans of last week’s Talgarth expedition was a small price to pay for the enthusiasm they displayed in helping to get - and keep - the club flying today. Yet again we had to cope with a brisk crosswind, and the competence and staying power which DGS solo pilots and trainees are demonstrating week in and week out in tackling and coping with such conditions is pretty impressive. A light breeze, straight down the runway, will come as a bit of a shock to us all, if and when that ever happens again! With such weather, the day turned out to be one big confidence building and learning experience, with not much in the way of soaring. However, a couple of trial lessons were achieved, bringing the club much-needed income and potential new members. The day ended with a small group of us having a constructive informal discussion in the clubhouse about various options for the short-term development of our fleet, to enable us to maintain that delicate balance of pre-solo, post-solo and trial lesson requirements - as well as fun and good humour - which are all so vital for the on going success of any gliding club. It was blowing a hoolie as the faithful gathered. Fortunately it was a 270 degree hoolie straight down the runway so DMX was wheeled down to the far end. More than one glider would have been too much of a handful as far as ground handling was concerned. There was quite strong thermal activity but the wind strength made it challenging to exploit the energy. What better time for more seasoned pilots to learn a few soaring tricks from the master and for the ab initios to experience flying at the more extreme end of the flying range. Everybody had their fill of flying. It was nice to get back to the clubhouse and out of the wind for a relaxing beer at the end of the day. Low cloud, strong winds and occasional drizzle sounds very familiar recently. This did not deter a hardy group of trainees and pilots. The early lectures were devoted to weather and winch launching. The usual suspects were working on the aircraft – many thanks to them for their efforts. 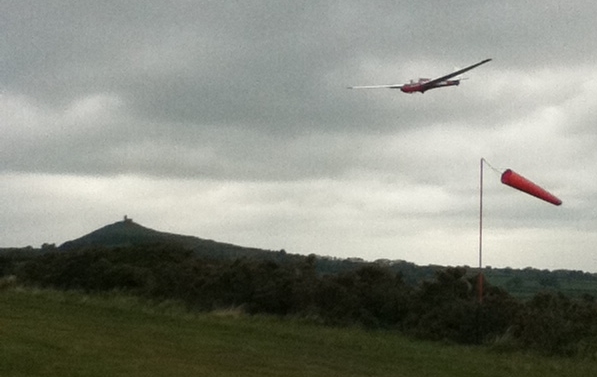 The weather improved a little by lunchtime, so glider out and off to the launch point. The 15+ knot southerly crosswind provided plenty of challenges and learning opportunities. 3 hours later the weather closed in, so, back to the clubhouse for tea and the third lecture of the day; Notams this time. Wednesday evening forecasts suggested good thermal soaring conditions for Thursday. So cross-country tasks were set, flying lists made and fingers crossed for a serviceable tug. The day was supposed to start early but overdevelop by early afternoon. On Thursday morning the optimism continued, gliders were prepared and watered by nine and everyone well breakfasted and entertained by Andrew's love of camping. By ten the forecast was clearly wrong, with the sky clouded over but, right on time, a new tug arrived. There was hope yet. Aero-tow practice commenced with some soaring opportunities in the difficult conditions. Half of the cross-country contingent resorted to local soaring, the other half (myself) decided to wait. By one o'clock impatience kicked in and I launched anyway, dumping water after 20 minutes while struggling to stay airborne. Conditions improved dramatically around Shobdon but the task then turned back to Wales and the poorer conditions, prolonged sink near the Brecon turn point adding even more fun. No flying today unfortunately,cloudbase 800ft, top of mountains 1000ft. Cloudbase below the ridge tops. Someone suggested walking op the nearest spine to look down the Cwm Du valley, half way up the spine the cloud lowered to 400ft with rain so all we got was a good soaking. Is there a collective noun for a motley group of wet glider pilots ? A squelch of glider pilots perhaps?? Phil Ged and Chris Kaminski gave the twin astir a wash and brush up. Martin arrived in the evening with 14 pieces of salmon which Marta & Don transformed into tandoori salmon with salad on nan bread, together with beer & 6 bottles of wine, a fine feast was enjoyed by all. Low cloud and drizzle kept the aircraft in the hangar and the pilots in the clubhouse. A little work was undertaken with Jeff Craggs masterminding the refitting of the simulator blackout curtains and Bob Sansom repairing the tail ramp on his K8 trailer. And then the somewhat sleepy day was brightened up by the visit of 2 ex members of the original gliding club to have used our site. We heard stories of how 40 years ago 2 embryo gliding clubs ( one with members from the Royal Naval Engineering College Manadon and the other a civilian club by the name of Albatross) hacked gaps into the gorse covered moorland which now forms part of our runway. They flew T21 and T31 aircraft using a barrage balloon winch and an old bus as clubhouse / launch hut and spoke fondly of the fun they had exploring the wave and thermals. Apparently these clubs flourished for a few years but lack of members saw their demise. DGS moved into the site 28 years ago. Our visitors were amazed to find a flourishing club on the old site and were particularly impressed by our wide clear runway; apparently they operated from, and landed in, gaps in the gorse??? Ged and I arrived at Talgarth on Sunday to an empty field no people, no winch or tug? Dave and his LS8 arrived. DGS pilots clocked almost 12 hours for their 7 launches. Looking up at sheep is a new experience in a glider that is still flying and climbing up past walkers on the ridge in 4 knots up makes you really appreciate how fast you climb. Marta and Chris our mid European contingent arrived this evening, and we were joined by Martin Smith for the evening. (I hope he was jealous). Today was a good day at Talgarth very friendly and welcoming and they even got us a tug to use. Nice soarable day with the wind from the NW. Lots of flying today with Simon Tree completing some more solo flights after his first solo yesterday. Best flights of the day belong to the K6e syndicate Martin and Alan who managed 3 hours between them., in fact, Alan had declared his silver cross country leg to North Hill but the day wasn't quite that good. Colin Boyde with Don in the back of the K13 went out towards Okehampton and ended up low over the hills and ridges at Sourton and, after a nail biting glide towards the airfield, they were saved from a field landing by some reduced sink and ridge lift over Blackdown. Good effort chaps. Today was a challenging day for everyone but not because the weather conditions were particularly tough but because there was so much else going on on the airfield. There was a group, lead by John Bolt and Martin Smith, continuing with the airworthiness project. In particular, BVB is receiving a lot of fettling. Many thanks to all those involved. A second group were de-rigging aircraft, installing them onto trailers, testing trailer brakes and lights in preparation for the trip to the Black Mountains Gliding Club at Talgarth where a group of DGS pilots are headed on an expedition all next week. We should get daily information from this group as the week develops. Watch this space. Thanks everyone for the good humour on this busy day. With so much going on at Brentor - even when we’re faced with poor weather and inevitable technical problems - finding something positive and interesting to report via the DGS Blog is seldom a problem. However, I thought Wednesday was going to be an exception when I arrived to find that following a technical inspection a few days earlier, ‘BVB’ - one of the two pillars of our training fleet - had been pulled offline for essential maintenance. This definitely set some challenges for today, but in true DGS style everyone rallied to ensure that the maximum use was made of our other 2 seater DMX. One-day course student Bob Andrews of Hexworthy, Devon) was straining at the leash, as well as several other members requiring pre-solo training or post-solo Ged and I - supported by CFI Don - embarked on a full schedule of training flights using our other two-seater, ‘DMX’, and by late afternoon not only had all of the day’s training objectives been achieved, but several people had been soaring as well. The Zugvogel - such a splendid soaring glider, but so often the Cinderella of our single-seater fleet due to its position at the back of the hangar - once again came to the fore and was enjoyed by several of our solo pilots. One of them even surprised himself (fortunately while thermalling at height) by discovering that the Zug can actually spin. But remembering what he had been taught, he recovered promptly - and returned to base somewhat wiser. In total - and after a latish start - we achieved a respectable 35 high and hassle-free launches, so a big ‘thank you’ to the dedicated team who made them all happen. 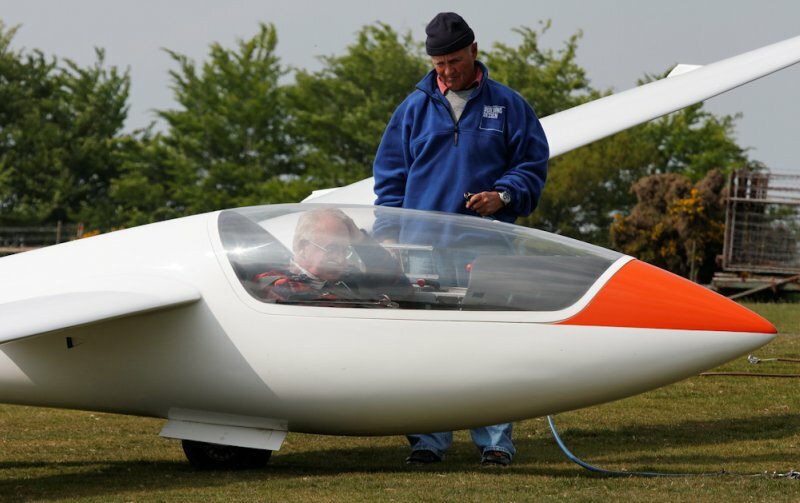 Around the launch point and back in the clubhouse, the main topics for discussion were the forthcoming Talgarth expedition and the club’s glider fleet development programme. Although as duty instructor, my focus was on activities of a more immediate nature, I get the feeling that the acquisition of a third two-seater is high on the agenda, with the possibility of bringing another Ka6CR on-line also on the cards. Looking ahead to next Wednesday, due to the Talgarth expedition we’ll be a bit short of instructors. But come along and we’ll do our best to get you flown. In particular, I urge all those solo pilots who are (a) not current, or (b) working through the Bronze C flying syllabus (or both!) to come along and get back into the swing of things. The wind was very , very strong from the south and, despite the desire to fly, common sense prevailed and this became a non flying day. But, ever resourceful, the assembled members used the down time to complete the cleaning, polishing and oiling service on both of the 2 seat gliders ahead of the scheduled dates. Don was to be found in lecture mode for the trainee pilots. By lunchtime conditions had improved so there was an almost indecent haste to get flying..
Today there were a lot of new faces. We welcomed Mike Harris, a lapsed Silver C pilot, Warwick Parramore ( yes, Sean’s son ) who is just starting out on his flying career and Mike Gadd a returning lapsed member. Welcome everyone and nice to see you enjoying the conditions. An ‘odd’ sort of a day really, with tantalising hints of lift most of the time, but deteriorating visibility and the battle between thermals and potential wave remaining inconclusive. Turnout was disappointing, which may have been linked to a lack of faith among members that there would actually be gliders to fly, combined with an adverse reaction to the rallying call to come and spend a couple of hours helping fettle the Zugvogel. As it turned out, there were gliders aplenty, and by the time it got really soarable, the Zug was on-line, gleaming and ready for action. At one point we had about half a dozen gliders soaring simultaneously, but even then BVB was just sitting there waiting for someone to fly it. Might that pilot have been you? A big thank you to Don for shouldering all the instructional workload, enabling me to get some solo time in the ASW 20F, and freeing-up Ged to spend the day slaving over neglected trailers (prior to the Talgarth expedition) and supervising the work on the Zug. Don’s three students, Martyn Sherrell, Chris Morton and Keith Wilson are not only progressing well in the air, but pitching in enthusiastically to help keep the airfield running. Despite the lack of ‘trade’ and a generally laid back atmosphere, some 30 launches were achieved. 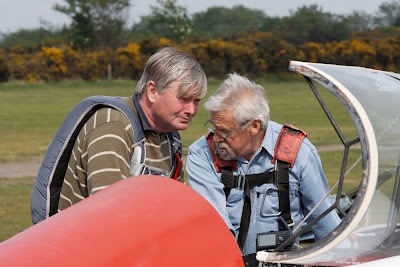 Bob obviously trying to remember how to fly the ASW20F while syndicate partner Martin looks on. Don and student pilot Keith hard at work. With as many people working on the Zug and the trailers as there were ‘playing’, it’s probably unfair to single out anyone for a specific mention. However, suffice to say that Phil the Farmer and Doc Robin had all the gear ready to go to enable our ‘winching ace’, Dave Rippon, to do his stuff… John Bolt seemed to be everywhere… and Martin Broadway gave us all a good laugh with his novel airfield levelling efforts. A 25 knot easterly breeze greeted the hardy and brave [dare I say foolhardy] few that turned out to aviate this Bank Holiday Monday. As our illustrious CFI pondered the heavens, Will Wilson and myself hauled DMX to the launch point, Nigel Williamson set up the winch and we all wondered what trials awaited us. As all of us are pre-bronze, dual flights were order of the day as conditions were going to be testing to say the least. They weren't going to disappoint! A wave bar over the runway to tempt any glider pilot. 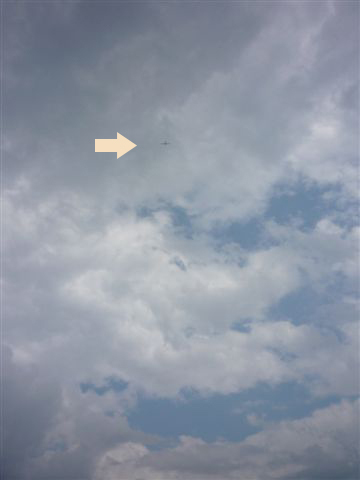 After 2000 foot launches suitable wave [and a weak thermal or two] were found and much valuable experience in soaring was undertaken. Will was unlucky to find some bad sink and landed after 23 minutes but Nigel and I were a little luckier managing to stay airborne for just under an hour each reaching heights of around 3000 feet. Once again Trevor Taylor showed us whipper-snappers how to do it by flying the Jantar for an hour and a half and reaching 6000 feet [he could have stayed up for longer and gone higher he tells us] while his young grandson amused himself by flying the simulator, another budding young pilot in the making. Many thanks to Don keeping the airfield open while North Hill, Culdrose and Aston didn't fly at all. We certainly were 'The Few' today. There are those who study the form books, and those who say ‘What the hell, that’ll do me!’ With an Easterly wind at 20kts and more, the going was firm to good for wave, but punters who passed an educated view over the atmospheric cross section saw that the profile for wave was not good and hence chose to keep their launch fee in their back pockets. And so it proved. The wind, straight up and down the runway from the East, should have produced wave, but didn’t; however those who flew had ‘character building’ launches into an instant 75-80kts indicated, leading to intriguingly smooth air off the wire, with some (was it ridge or was it wave..?) lift around the easterly facing slope of the site, followed by challenging descents at not less 65kts through the turbulence to land in a surprisingly smooth lee close to the ground. Many thanks to Martin Smith, Simon Tree, Chris Morton, Hugh Thompson and the Sunday Crew (you know who you are) for turning up and putting some confidence building and safely handled flights under your belts in conditions in which others would not even have bothered betting on. Seeing the branches bend and leaves shake on the journey home I think we can safely say we’re current in flying in high wind conditions! Strong easterly wind swung rapidly to the north to curtail any ideas of good wave today. The truly awful visibility did improve briefly to allow a few training flights. The site was otherwise busy though with Ged working on the ML winch brakes, Martin Broadway cleaning up the workshop and Martin Smith and John Bolt working on the club fleet. Later, a committee meeting was held to discuss the club fleet and to explore ways of ensuring a high level of aircraft availability whilst continuing with the current maintenance effort. I expected that Don will be sent to the Tower for opening the airfield on the same day as the royal wedding. The wind was in the east with wave influences apparent throughout the day. The morning was very murky which eventually brightened up to allow some flying which teased the pilots with promises of wave which proved to be particularly illusive. The tea fund has now contributed a stylish metal and glass patio set to match the new BBQ for the clubhouse patio area..